Tooth extractions are done for a variety of reasons: you may have too many teeth, causing overcrowding in your jaw or you may need to have braces placed on your teeth. This is considered oral surgery because the dentist or oral surgeon has to anesthetize you before extracting your tooth. Because the tooth is forcibly removed, you will experience pain, some of which could express itself as an earache. Pain that seems to originate in your ear after having a tooth extracted is not unusual, according to Dr. Jerome Tsang, replying on MedHelp. Nerves going from your teeth and jaw cross around your head. After a tooth is extracted, the nerve pain coming from the socket where the tooth was pulled sends out a pain response. 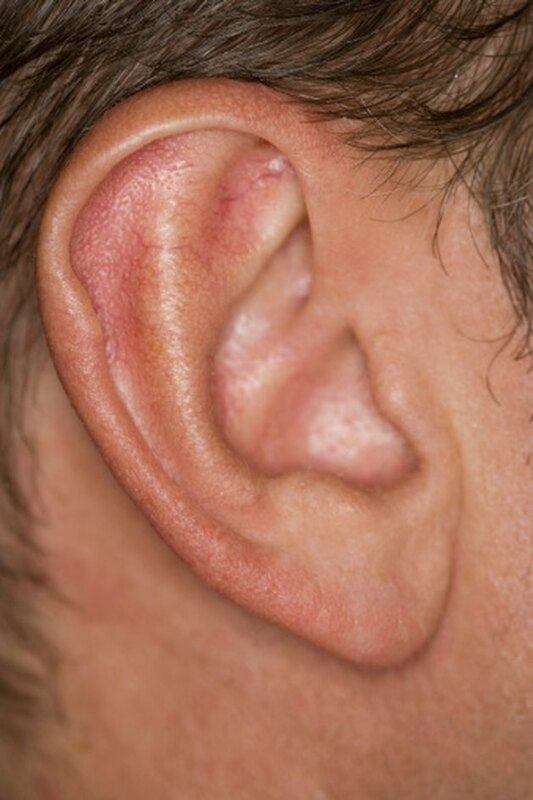 The pain travels along this nerve up to and around your ear, making you feel the "earache" pain. Dr. Tsang says that, as your extraction site heals, the pain around your ear should subside. The tooth that was pulled out can cause your jaw muscles to spasm, which causes ear pain. When you feel earache, the muscles around your ear might be those that allow you to open and close your mouth. As they go into spasm, the pain impulses they send out travels to and around your ear. Your ear pain may be short-term or it might go on for an indefinite amount of time, according to Dr. Joel S. Tieg, writing for All Experts. Your pain may become intense, especially if your "referent pain" travels from the extraction site to another area -- around your ear or to another tooth. As you clamp down on the gauze to slow the bleeding, your pain could become even worse. Your only sources of relief may be morphine-based prescriptions your dentist has given to you, a bag of ice, a warm compress and sleep, according to the Tooth and Teeth website. Once your tooth has been pulled out and you recover from the anesthetic administered by your dentist, you may feel the pain not only from the extraction site but from the teeth nearby and possibly around your ear. If the tooth that was pulled was crucial to the alignment of your teeth, when you bite down your remaining teeth will not meet as they did before. As this happens, these teeth will take the impact of your jaw closing, possibly causing pain to move to your ear. While an earache after a tooth extraction is normal, if your pain gets worse or if it is constant, call your physician. Your earache pain may be coming from your extraction, from an ear infection or from an infection at the site of extraction.